Unsurprisingly, smartphones in their current form are an extremely distracting piece of technology. Everything from the hardware down to the interface, the features, and all the catchy, vibrant colors of the apps are designed with the sole purpose of getting your sole undivided attention. And that's a bit of a problem as it fuels a dangerous addiction. Over the years, several startups and manufacturers have tried cracking down the code laying behind the simplistic approach at mobile technology. Devices like the Light Phone, Smartisan 2, and jokes like the noPhone are just a few examples we could name off the top of our heads, but all of these were a bit on the simple side. Meanwhile, this newcomer to the smartphone scene is definitely spicing things up a notch. Meet Bllos, a German-based startup that aims to bring back the whole concept behind smartphones back to its roots. Lo and behold, "Back to the root" is actually Blloc's motto, and it perfectly resonates with what you're about to see. And what about that sleek design? Pairing a zinc alloy frame with glass panels at the front and the back make up for a super-sleek appearance that would most certainly feel great to experience and interact with. Yes, glass is probably not the best material to adorn phones with, but Blloc's promising warranty policy will alleviate some of the pain. 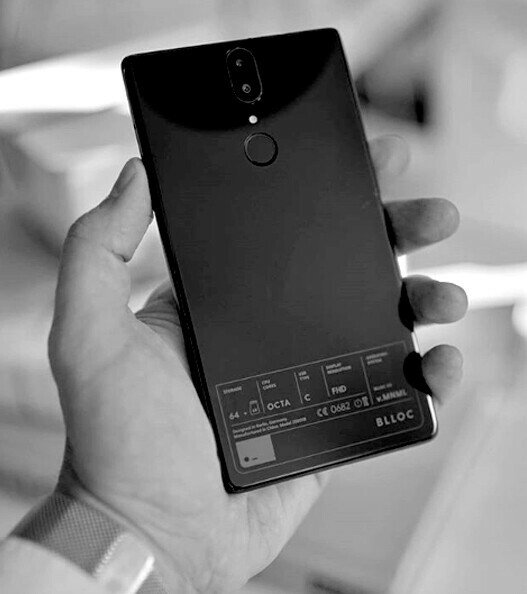 Blloc's first upcoming phone, the BllocZero18, comes along with a super-minimal design, power-efficient hardware, and software steered towards simplicity and wholesomeness. 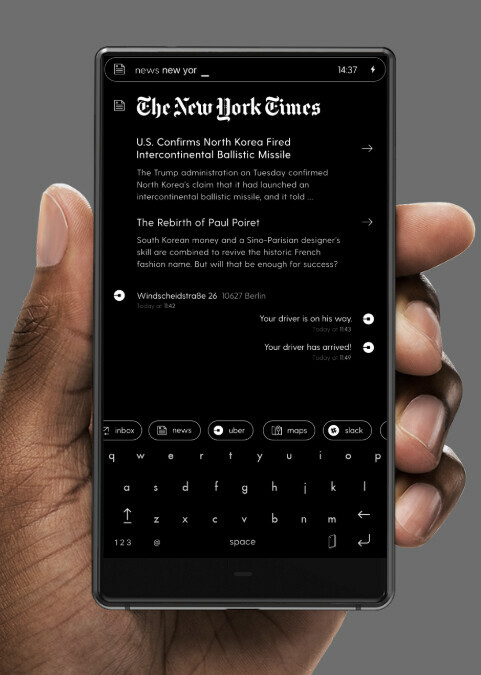 The device will be the company's Blloc OS based on Android 8.1, but you will be challenged to tell that at a first glance - the regular Android interface has been substituted for a distraction-free environment dubbed the Root which unifies all of your various app exchanges into a single clutter-free timeline, with only the most essential features at your fingertips. Of course, this is a huge boon to productivity. Blloc says it has worked hard on integrating some of the most popular apps into its interesting timeline feature: Facebook Messenger, Weather, Uber, Whatsapp, Google Maps, News Service, Spotify, and others are all a go. Probably, more will come in the future. 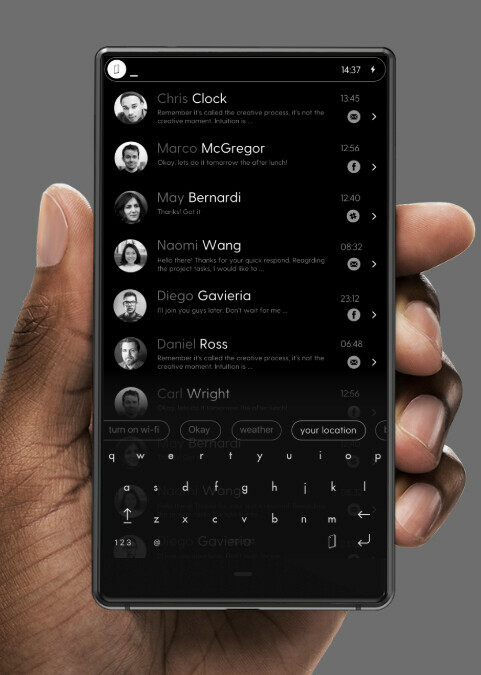 But probably the most striking aspect of the BllocZero18 and likely any other upcoming phones from Blloc is the fact that by default it treats you to a purely monochromatic, black-and-white interface. 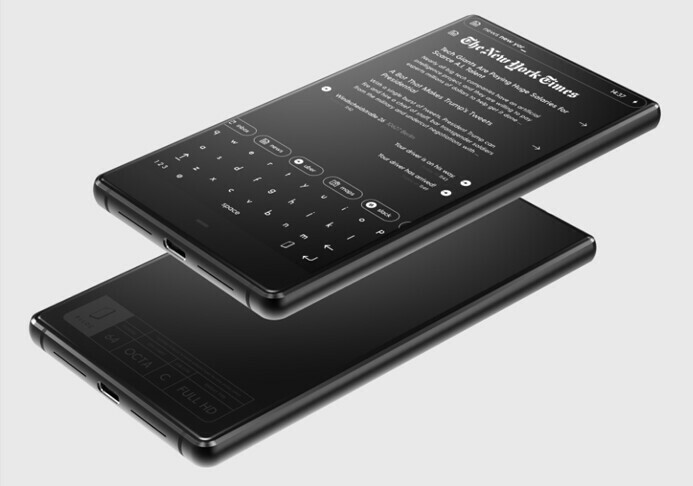 This is no coincidence: aside from greatly reducing power consumption, and therefore improving battery life performance, an interface tailored around black and white corresponds quite well with the philosophy of Blloc. See, in photography, shooting in black and white is considered one of the hardest techniques to master as it requires an utmost control over your composition. The the timeless combination of black and white is the perfect allegory for simplicity. Also, it helps you focus. Also, it looks very stylish. Also, it looks sleek. But always experiencing nowadays' web content and social media in monochrome? We are not sure about that. Thankfully, Blloc is perfectly aware of that. It seems that as long as you keep your finger on the rear-positioned fingerprint sensor will turn the interface from B&W to a much more traditional vibrant one. 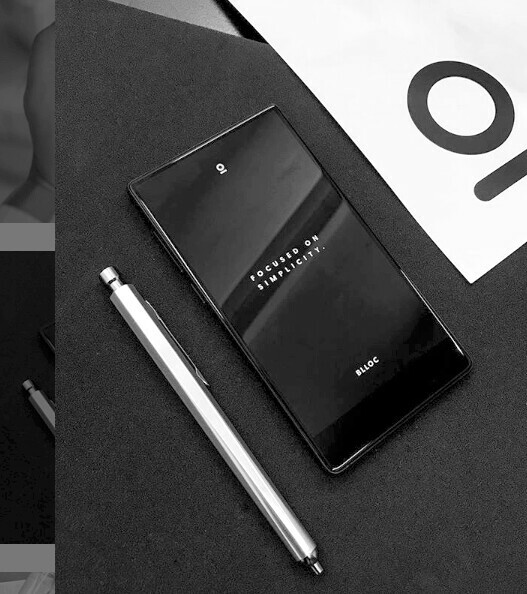 Take it away, and voilà, your phone is back to monochrome mode. As far as hardware goes, the BllocZero18 has some decent hardware inside. A Helio P23 processor aided by 4GB of RAM and 64GB of storage does the hard work in the background, while a 5.5" LCD display with a FHD+ resolution and a contrast ratio of 1000:1 proudly stands up front. There's a 13MP Sony IMX258 Exmor RS-powered camera at the rear of the phone alongside a 3,100mAh battery that should keep the lights on for a while. A 3.5mm audio jack and a USB Type-C port complement the specs sheet of the phone. Another interesting thing that Blloc seems to value a lot is your device's well-being. As it so often happens with modern gadgets, hazards lurk around every corner, and nobody likes a broken phone, be it cheap or expensive. That's why Blloc has got its future clients covered in case of all types of damage for the first 12 months after a purchase - talk about a promising out-of-box warranty! Lastly, when it comes down to pricing, Blloc has put a rather reasonable EUR359 price tag on the BllocZero18, which would translate to ~417 dollaroos. A stomachable price given that most startups tend to overprice their first products with the hopes of breaking even. 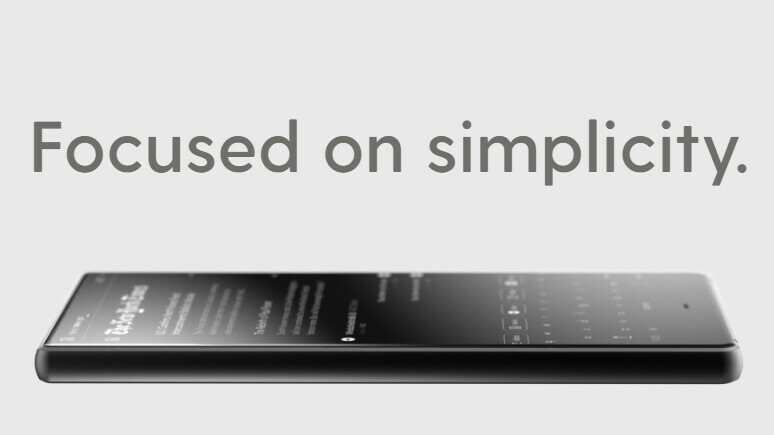 Such a price tag would likely make lots of consumers unironically consider this device should its focus on simplicity and "back-to-the-basics" mantra float their boats. Actually, you can register your interest for the device right now and you'll be notified once it's up for official purchase. Smooth sailing and best of luck, Blloc, we hope to hear more from you in the future! For more info on the BllocZero18 and Blloc as a whole, do visit their website right here. Looks a lot like the Mi Mix phones. I am not sure that they will have more luck that Essential. "417 dollaroos" dollaroos ? Lol The bottom bezel looks ugly and too big, they should have gone with a design similar to the S9 instead of wanting a bezel-less design with a both bottom chin. I'm definitely feeling the monochrome menu and system details, but photos, videos or any media should have colors or at least an on and off toggle instead of the press and hold option. God, does this minimalism style look boring to me. Now that you stripped off the colors for the interface, its literally a graveyard to eyes and mind. Too bland to me. Already hated the iOS design language switchup, and this UI just kills me. Default B&W filter just straight up goes out and kills my entire family. Anyway, won't it be hard to read anything under bright lights? (the sun, duh) The white detailing/lines are quite faint, lots of grays in text + everything's dark. And I don't have the confidence that a new company can pull out a decently bright display to combat the sunlight. If they can, yay. This is how, imo, you take simplicity TOO FAR. When I originally saw this, it was still using the design you have shown here. The latest version is just another generic rounded blob. The '17 design was the whole reason I was even paying any attention to this phone, but they dropped it pretty quickly. 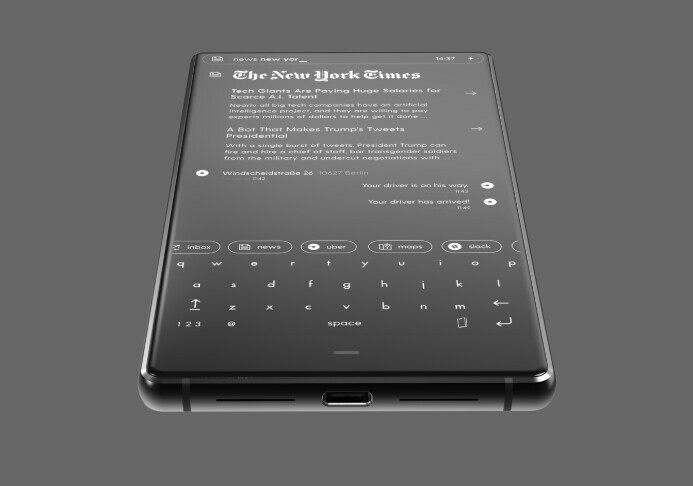 And the printing of the specifications on the outside is the only distinctive design feature they have now, but I doubt that would be considered as a thing adding to the minimalism. Plus there are other questionable decisions such as the Helio P23 instead of, say, a P30, and there's no Bluetooth 5.0, plus they dropped to a single camera for "minimalism", but instead put another one on the front. I really like the concept of this a lot. It forces you to stick with what you can read (for the most part) essentially and I like that. I hope that you can uninstall what you wouldn't use though. I'd need to see more reviews. I'm not really liking the device.